Yesterday on 7th September 2018, this website has completed 10 Million page-views. This was possible only because of regular visitors like you who enjoy solving puzzles and love to visit our website. This Jigsaw Puzzle is to say Thanks to the wonderful audience like you. Please do share this website with your family and friends, so that they can also enjoy solving unlimited free puzzles on this website. This Easy Jumping Frog Jigsaw Puzzle is for Kids. There is picture of Jumping Frog from where one square piece is taken out. Your challenge is find the correct missing piece which is taken from the puzzle image. Lets see how much time you will take to find this missing piece? 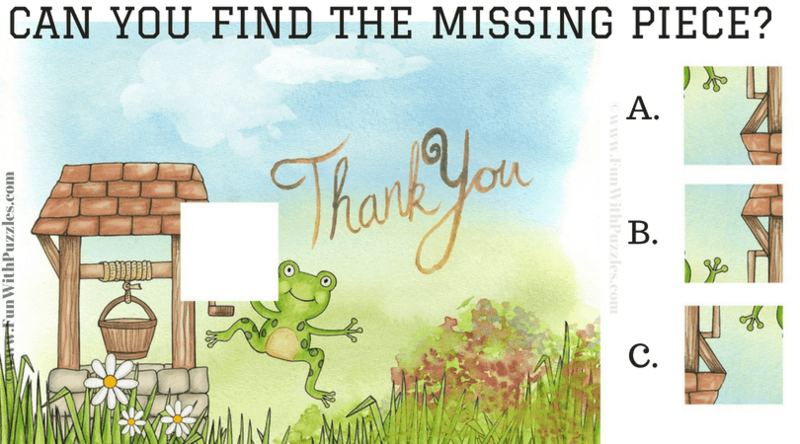 Can you solve this Jumping Frog Jigsaw Puzzle? Answer of this "Jumping Frog Jigsaw Puzzle for Kids", can be viewed by clicking on button. Please do give your best try before looking at the answer. answer is c of the missing piece puzzle😓😕😌.I think so it is the correct answer. otherwise you tell me what is the correct answer.